More on Literary Snobs – Have We Had Help? I think the 'Big Six' are wondering what hit them Jack. The publishing world is changing way too fast for dinosaurs. At the moment, if you stand still, you get run over!But I do think readers are adapting very fast along with a new younger generation that have discovered a way in which they like to read. Perhaps you could call it the iPod effect. The young were born with technology in their pockets, so putting book in their pockets is a great thing.And they don't care who published the book. If the like it, they like it. Or not! This is a food for thought article. The ‘Writers like Dickens were panned beyond belief when they were first published; something the pompous literary snob of today conveniently seems to forget;’ is a similar experience self-published authors often have to go through.I will share the experience of a National Honor Society member with a 4.0 GPA. How he and his friends in high school absolutely ‘love‘ one of my books. It was being passed among the students until it disappeared. As a student, he wanted to write a book report on it. But the teacher in front of the class used it as an opportunity to undermine ‘self-published’ books and authors. Yes, the teacher said would read the book too.In the end, it did not change the others students view of the book's contents; however, I felt it appropriate to share my experience with your quote and well written article above. I agree and disagree 🙂 I'm not sure I'm comfortable calling them 'literary snobs' or lumping them together with the traditional gatekeepers of the publishing industry. I don't think they're entirely wrong. Remember that these people are readers too. They're not some monsters out to put down the work of hard working authors. I think we have to understand the reasoning for some of their decisions. All authors believe their works are worth publishing. That's the arrogance and confidence of all authors, otherwise we wouldn't have books to read. But the sad fact is that a large percentage of those are barely readable, either because they're so badly edited that you can't get past the first page without being pissed off at the number of errors (most of which would disappear if they bothered to pass it through a simple spell/grammar checking) or they should work on their craft a few more years before they inflict their works on the rest of us. But because of the ease of self-publishing, all of these books are being released to the hapless public, flooding the market and making it an impossible haystack that we must all endure to get to the few needles worth reading.I, for one am pissed off with the amount of time I have to waste reading crap in order to find the good stuff and it's becoming much harder now because there is so much more 'stuff.' I prefer relying on reviewers with good, reliable reputations and the same taste that I do instead of relying on publicity and recommendations by Amazon that is based on services they are paid for.One other thing, I find that I have far less of a problem with enjoyable and quality books when I go to a bookstore or look for books from reliable imprints. Not to say that they don't sell some crap too, but I find far fewer books that make me want my money back. I also have found some great new authors who are from indie presses, and some who are self-publishers, but the percentage of those are far less than from the established presses.I'm having a grand old time going through my list of favorite authors, people like Barbara Hambly, David Eddings, Anne McCaffrey, P.D.James and read the backlist items I missed the first time around and most of them don't disappoint me. While I am not happy that their books are far more expensive than I think they should be on Kindle, I will invest money on them because I know I'm getting enjoyable quality, not because I'm a snob but because of my personal experience reading their books.At least, that's my own personal experience. I'm sure other people have had different experiences. In the world of ebooks these days on sites like Amazon, we are given the option of "Look inside", the electronic version of reading a couple of pages. That's where I decide if I wish to read any further by buying a copy. I don't simply buy blind. If I can't read a couple of pages, then I won't buy, unless someone else has already read it and maybe deposited a review on Amazon or Goodreads. But at least I don't simply ignore someone new on the scene as the literary snobs still do. Bravo for this article. 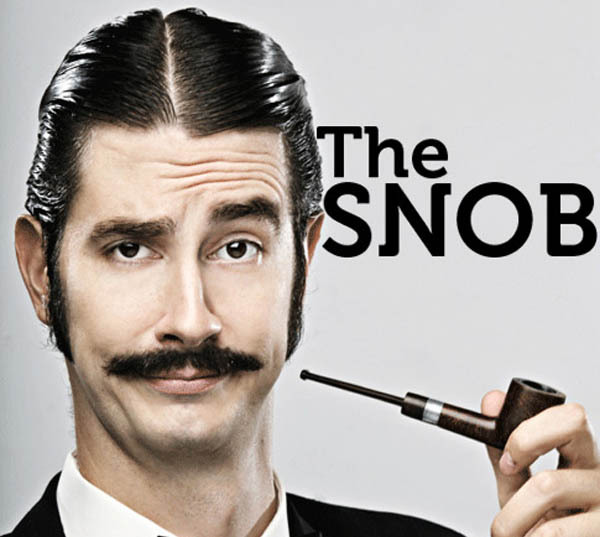 The snobs are with us always, and if writers aren't careful, the putdowns snobs issue from all orifices can be crippling. These "intellectuals" often play a two-step game: First, upon learning you are a writer, ask, "Have you written with any publisher I've heard of?" as if the only presses of worth are those THEY have heard of. If it is a small press, then they can dismiss it with a snort. If a well-known press, they then follow up with something like, "Yes, but when are you going to do some serious writing?" The best reply to either the snort or this question is a thoughtful fist to the mouth of the questioner. However if there are witnesses about (and sadly, there generally are), a writer must do his best to maintain self control and perhaps ask, "So, have you had anything published lately in journals no one reads?" Great article Jack. There is a fine line between an online literary snob and a troll. The distinction is easily blurred.